As August falls into the shadows and September brings us summer’s final lingering days, I find myself clinging to nature’s greatest gift during these hot and humid months, the tomato. And while I will happily indulge in an heirloom dressed in nothing more than its birthday suit, it is a perfectly crafted caprese salad that will leave me pinning for summer’s swift return. I mean, what could be better? Plump, ripe and meaty tomatoes intermingling with soft, slightly salty folds of fresh mozzarella, bright green punches of flavor on hand courtesy of the basil overtaking our herb boxes. Add a drizzle of olive oil and a bight of balsamic vinegar and it’s hard to imagine a more perfect cast of characters for a meal. But with summer ending, what if we doubled down, turning the dial up, ever so slightly, on each of these beloved ingredients? The inspiration for this dish was born of my obsession with burrata, a variation of mozzarella cheese that will spoil you for the rest of your life. 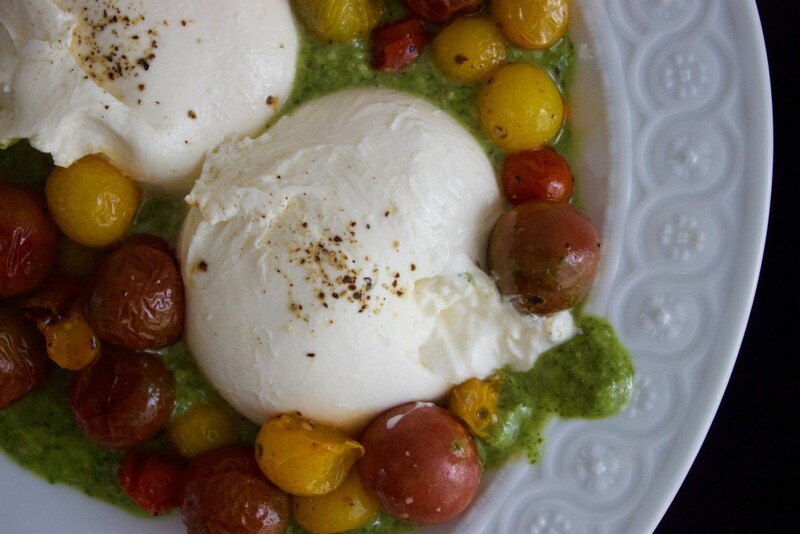 Proceed with caution; burrata will make just any old ball of mozz seem insufficient. As if hand spun balls of mozzarella weren’t good enough, the Italian Gods took things a step further, using the strong-souled folds of mozzarella cheese to create a pouch, filling it to the brim with shreds of curd and fresh cream. While they may appear similar on the surface, a quick slice through burrata’s thin skin reveals the spreadable goodness that lies beneath. At first brush I simply subbed out my mozzarella for burrata, a perfectly acceptable choice; however I knew in my heart that it deserved more. Thus we find ourselves with this recipe, local mini heirlooms roasted hot and high – breaking the traditional tomato-in-the-oven rules – until they begin to pop and crinkle, sugars caramelizing and flavors intensifying. A piquant pesto is the basil-binder, the final flourish on this impressively easy to construct communal appetizer. Serve with ample fresh bread for scooping and a barn-yardy chianti and relish these final days of sunshine as the scales tip slowly in fall’s favor. To begin, preheat the oven to 415 degrees. 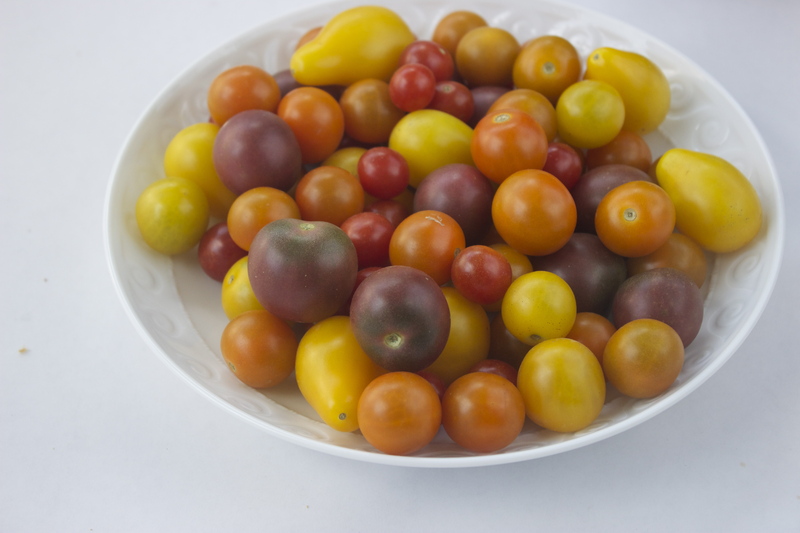 Toss one pint of locally grown heirloom tomatoes in one tbs of olive oil, one quarter tsp of kosher salt and one eighth tsp of freshly ground black pepper. 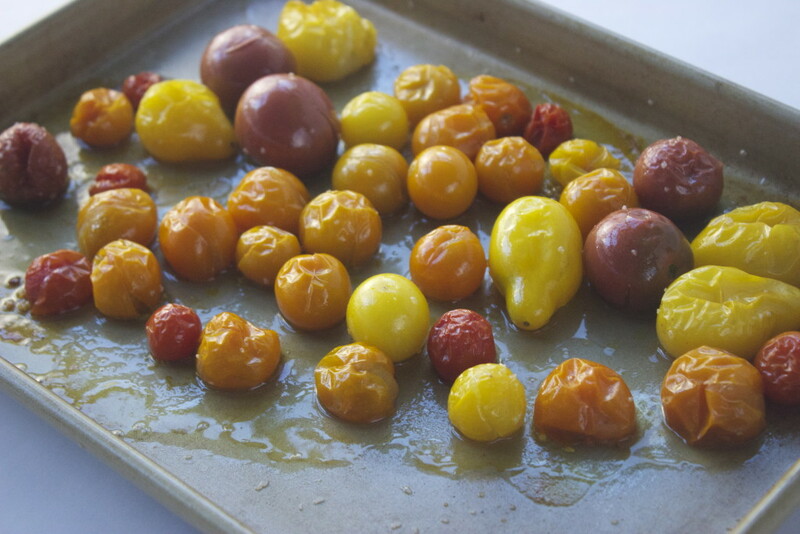 Spread evenly on a sheet tray and roast for 10-15 minutes, until the tomatoes begin to pop and crinkle. Remove from the oven and set aside. 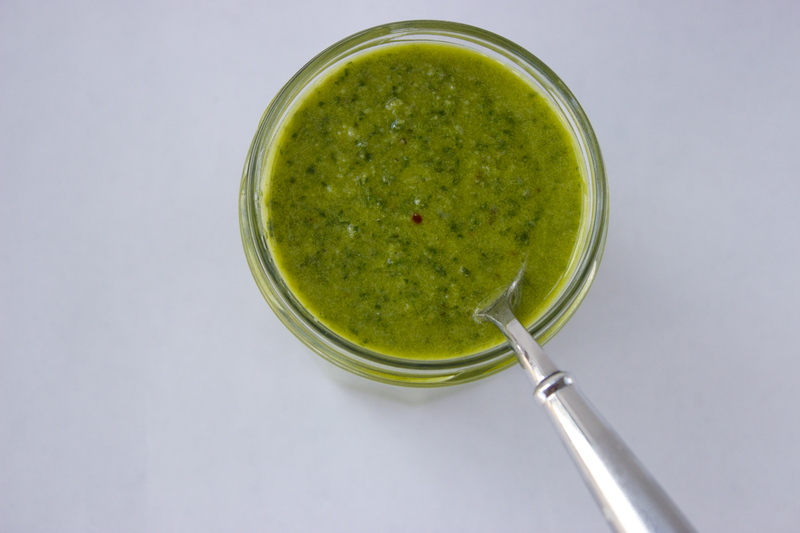 While the tomatoes are roasting away turn to the pesto. Assemble the following ingredients: two cloves garlic, one quarter tsp red pepper flakes, the juice from one lemon, one third cup walnuts, two cups fresh basil, firmly packed, one half tsp kosher salt, one quarter tsp freshly ground black pepper, one cup good quality olive oil and one half cup freshly grated parmesan cheese. 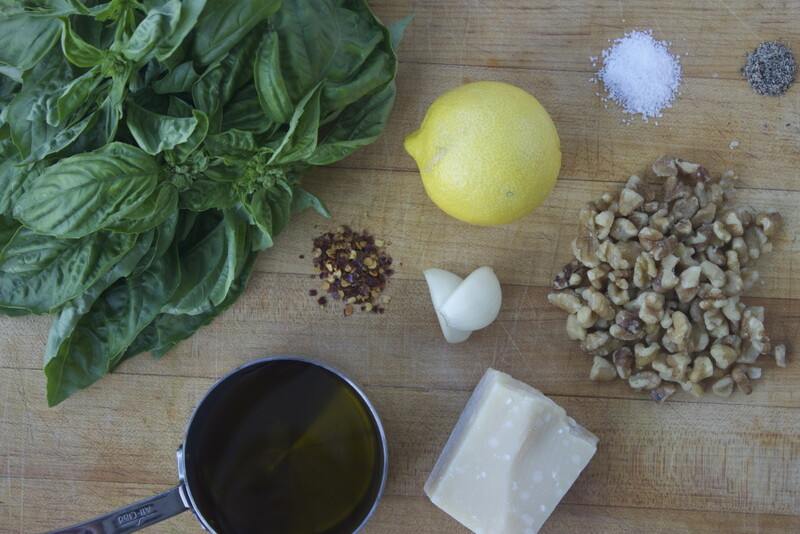 Add the garlic, red pepper flakes, walnuts, kosher salt, black pepper, and basil to the bowl of a food processor. Pulse until combined and chopped. Add the juice from one lemon and pulse to bring everything together. Next, with the blade running, slowly pour one cup of olive oil into the feed tube. Scrape down the sides of the bowl and stir to make sure everything is combined. Add one half cup freshly grated parmesan cheese and stir with a spoon. Taste for seasoning. Remove to a bowl and set aside. Time to dig in! Spoon a layer of the pesto on the bottom of a serving dish. Carefully place the balls of burrata on the pesto. Scatter the tomatoes around the burrata, making sure to scoop up the juice and seeds left on the bottom of the pan from roasting. Garnish with a small sprinkling of freshly cracked black pepper overtop of the burrata and serve with slices of your favorite baguette, warmed in the oven. Enjoy! 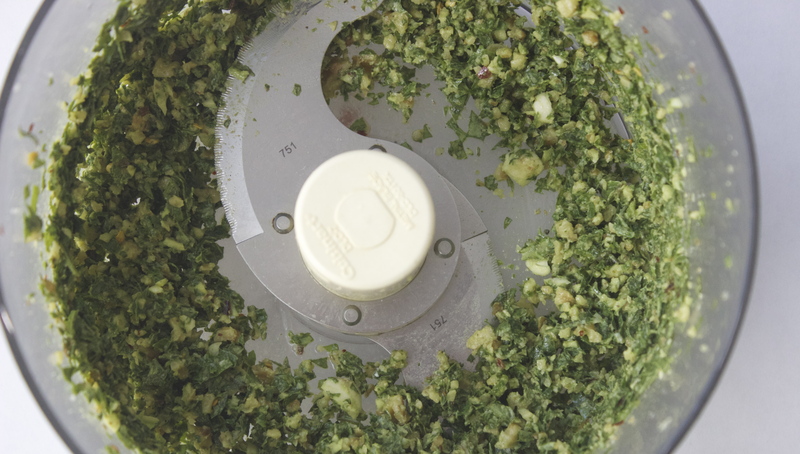 Place the garlic, red pepper flakes, walnuts, kosher salt, black pepper and basil in the bowl of a food processor. Pulse until combined and chopped. Add the juice from one lemon and pulse to bring everything together. Next, with the blade running, slowly pour one cup of olive oil into the feed tube. Scrape down the sides of the bowl and stir to make sure everything is combined. Add one half cup freshly grated parmesan cheese and stir with a spoon. Taste for seasoning. Remove to a bowl and set aside. Preheat the oven to 415 degrees. Toss one pint of locally grown heirloom tomatoes in one tbs of olive oil, one quarter tsp of kosher salt and one eighth tsp of freshly ground black pepper. Spread evenly on a sheet tray and roast for 10-15 minutes, until the tomatoes begin to pop and crinkle. Remove from the oven and set aside. Spoon a layer of the pesto on the bottom of a serving dish. 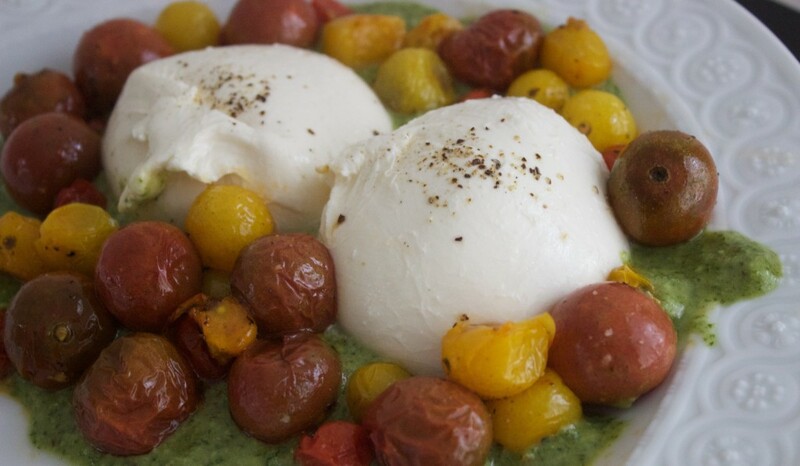 Carefully place the balls of burrata on the pesto. Scatter the tomatoes around the burrata, making sure to scoop up the juice and seeds left on the bottom of the pan from roasting. Garnish with a small sprinkling of freshly cracked black pepper overtop of the burrata and serve with slices of your favorite baguette, warmed in the oven. Enjoy!